As a player, MacFadyen spent 15 years at Motherwell, where as a centre forward he scored 52 goals during the Fir Park club's League Championship winning season in 1931/32. Picking up two Scottish Cup runners-up medals, he also collected an FA Cup runners-up medal during a spell at Huddersfield Town. MacFadyen appeared for several English clubs as he served in the RAF in the Second World War, and in 1945 MacFadyen was appointed secretary/manager at Tannadice at the age of 41. MacFadyen held the position for nine years, in which he built a memorable attack minded team, spearheaded by the legendary Peter McKay. But a lack of finances and a defence that shipped as many goals at the forwards could score hampered the Club's chances of promotion to the top Division. During his time as manager, United pulled off an amazing Scottish Cup shock by beating Celtic 4-3 at Tannadice in 1949 - a match that saw the team nicknames the Terrors' - but he also oversaw the Club's worst ever score, with the 12-1 defeat to Motherwell in 1954. 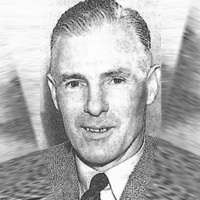 After four straight defeats at the start of the 1954/55 season MacFadyen resigned, and stepped away from football altogether.